Is it just me, or are squirrels just the stupidest animals on the planet? As a road runner, particularly one who grew up in the Midwest, I've seen more than my fair share of roadkill during runs. It's never a pleasant moment, and it always makes me sad for the little guys, especially when no one cleans them up, like the armadillo at the bottom of our hill. Gross. Some animals are simply too slow to make it safely across our massive freeways, but with squirrels, I have to believe that a good portion of the blame lies with them. 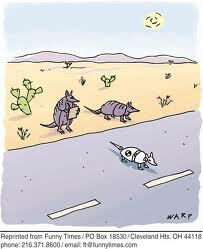 These are quick little creatures who should have no issues with outrunning something that isn't chasing them. Their problem stems, it seems, from their inability to decide what the predator (be it car, dog, or runner) will do next. And the interest and intelligence level of the squirrels varies depending on your region of the country. The critters on my college campus had grown so fat from being fed on football weekends that they mostly just sat around on benches waiting for someone to deliver their next meal. They probably told themselves that they were storing fat in their bodies for the long, brutal winter, but we all knew the truth. Those squirrels were lazy, pure and simple. They were safe, though, because no one's going to drive their car on a park bench, and they weren't about to start running across streets. Living in DC, I noticed that the little rodents were much skinnier and far more daring. They'd get together in gangs of three or four and as soon as you were alone on the National Mall, they'd surround you, taking your food, money, and shiny objects. If you ate at an outdoor cafe, you couldn't take your eyes off the table for more than a few seconds, because if you did, you'd turn back to an empty plate, save the little acorn they left as a calling card. Down here, though, I genuinely think that they're just plain dumb. My wife had mentioned that there were some squirrels taunting our pup from outside the windows of our apartment, and that on walks, they wouldn't back down from her, but rather stand and wait for the dog to make a decision. They do that little head fake that you've seen them do as they run to the middle of a road and stop, waiting for your car to make up its mind, and then they (almost invariably) choose the wrong direction, narrowly escaping disaster. All of this could be forgiven when discussing squirrel versus car. I mean, the cars are so fast and huge, of course the little guys are going to freak out. But I'm sorry, squirrels, when a runner is coming up on you at an easy pace, and you cross the path a good fifteen feet away, there is absolutely no reason for you to suddenly turn around and charge at the runner. It scared me to death, and caused me to jump off the path, stepping awkwardly with my bad knee and cursing the little bugger who was now halfway up the tree. I've got my eye on you, squirrels. This little conflict tweaked my already unhappy knee, and led me to slow my pace just a little bit. Still, I felt pretty satisfied with the run as a whole. It was my slowest pace of this season for my shortest run. I resisted the urge to push myself, choosing instead to follow the advice of the Mr. Hal Higdon, who tells me that under-training is actually better than over-training. I'm doing some more for my joint health in general, so I'm hoping that by taking it relatively easy in the next few weeks, I'll be at full health before too long. Now to do some icing and resting. I've got five miles in the morning, and with a knee that is being troublesome, the animal kingdom is evidently out to get me. Today, I discovered a new maxim by which I will live. Do not, less than 15 hours before a long run, eat a box of macaroni and cheese. Yesterday morning, my scheduled long run day for this week, I woke up with some pain still in my knee. I was very tired, having had a late-night rehearsal, and I could feel - actually feel - the fact that it was wet and rainy outside. I rolled over and went back to sleep. Knowing that today was set aside for "cross-training," I decided to switch my days. I did some walking, but took it easy for the most part. After my late rehearsal, I made an ill-informed dinner choice and went to bed not long after. This morning, I didn't have any more time to push back the long run, so I got up and prepared to head out into the still rainy weather. My wife has started running as well, much to my delight, so she was getting ready at the same time. The dog was very concerned. It made me exceedingly happy to have such an energetic start to a Sunday morning. One of the major reasons that I restarted this journey was to force myself toward a healthier lifestyle, and now it feels like we're living it. I took some time to stretch, and warm up my muscles just a little bit. My wife took the dog with her, and I headed down the hill. My current training schedule stresses maintaining an easy pace as opposed to building any sort of speed, especially early on. I've found something interesting about this goal, though. By trying to maintain a slower pace, I actually end up going faster than I want. As of right now, I don't know what my goal pace feels like, so I'm having some difficulty making myself stay in it, but of course that's what training is all about. As of right now, I shouldn't even necessarily be timing my longer runs, but I like to keep track for my own records. I think it's still okay as long as I'm timing myself in the hopes of being OVER a certain time, instead of under it. I was under my time for my first four miles, at which point I made it onto a trail, and it was far more difficult to know where exactly the mile splits were. Once I got to this point, I tried to just hold my pace where it was and hope for the best. Not thinking about my time gave me a chance to look around at the other folks on the trail, which, despite the rainy weather, was exceptionally full. I saw a few finisher shirts from last week's races, and all of them made me smile. I even saw one person I knew on the trail, which doesn't happen very often. I don't know many people in the town yet, and seeing someone familiar makes it feel just a little bit more like home. The trouble didn't really start for me until almost the 7 mile mark. With one mile left, I learned my aforementioned lesson about what not to eat the night before. I stopped my watch and looked around for a port-o-john, and I saw two. Neither, I soon learned, was suitable for human occupancy. I pulled it together, cleared my mind, and headed up the hill for my last mile. Today's Hero Song was Eminem's Till I Collapse, which took my mind off other issues and put my focus squarely where it belonged. Up the hill. Drenched with sweat and some rain, I crested my last hill and took a deep breath. I 'd just run 8 miles without any pain in my knee, and without any issues other than meal choice. I felt strong and satisfied, and I'd run faster than I had intended, while maintaining what felt for me to be an easy pace. I'm excited about season 2. And I'm excited for tomorrow's run. Today began my next round of training on my 50 marathon quest. This time, I'm headed to the Pacific Northwest for the Seattle Rock 'n' Roll Marathon. Though this is actually my third marathon, I'm considering it Season 2, since the first marathon was done without training, and the training is what takes most of the time. I consider the Columbus Marathon to have been a pilot episode of sorts. It's off in it's own little corner of my mind, but the meat of this challenge began at the end of last year, and it continues today. For this marathon, I'm using a new training program that I found online from Hal Higdon. I went through a few different websites before I decided on this one. The first thing that drove me to this particular plan was the fact that it is set up to go for 18 weeks, a full 6 weeks longer than my last plan. This spreads out my mileage increase over more time and gives me the opportunity for recovery weeks where my long run is actually shorter than the previous week. It also means that I'll run two training runs of 20 miles instead of just one. I feel like that will help bolster my confidence in the distance by leaps and bounds. Another nice thing about this system (link at the bottom of this page) is that there are several different levels at which you can train. I looked at the Advanced Levels, but then I asked myself exactly what it was that I was trying to accomplish right now. If I absolutely felt that I needed to qualify for Boston in June, then maybe I'd push myself harder, but I'm not at that point yet. I've got three more races to run this year, so my priority is to train smart and avoid injury. And it'd be nice to be able to walk around Seattle after the race. So I'm starting this round at Intermediate I, and we'll see how it goes. If I feel particularly strong, I'll bump myself to Advanced for MCM. If not, no worries. There's an Intermediate II. The big thing for me this time around is that I'm going to force myself to have more control over my pace. I'm going to shoot for a 7:30 pace for the marathon (3:16:30 total time), so I have to train at or around that time. This program has certain workouts that are designed to be done at race pace, to force the body to get used to running it. When you're in the midst of thousands of other runners, you need to know what your pace feels like. Whereas I have always had the theory of "run as hard as you can," I will now do my best to maintain a steady pace for the benefit of race day. This will cut back on muscle strains and injury, and it will better prepare me, mentally, for the race. I got to put this to the test right away. Since the marathon is 17 weeks from tomorrow, I joined the training program a few days late, and today's run was a 5 miler at pace. It was my first time on the road since Sunday, and I felt surprisingly good. It takes a few days to figure out what exactly the marathon has done to your body, and I know that I've got some strain on my left side, but I stretched out long and hard before I got out the door, and I was happy with the way everything felt. I took careful note of my mile markers before I left the house, as I wanted to make sure to keep myself on my pace for the entire run. Since I actually got up on time, it was quite cool when I headed out the door. I'll enjoy that now, while it lasts. I'm sure I'll be pining for 50s when summer gets here. With my muscles nice and warm, I headed down the hill. My first mile was only 2 seconds off my desired pace, which made me very happy. However, I had to acknowledge the fact that it was mostly downhill, and so I made a conscious choice to be just a bit stronger on the second mile. Apparently this was not necessary, because my second mile was 30 seconds too fast. I readjusted and did the math to figure out where I wanted to be for my turn-around. Since the point is that I run a certain mile pace, I didn't want to go too slow so that it "averaged out," so I just resolved to stay 30 seconds ahead of the pace, and I was right on at the halfway mark. The check at the 3 mile point showed that I'd gained another 15 seconds, but I was more concerned about mile 4, which would be my mental challenge. Not only is it late in the run, but it leads into a ginormous hill, so I had to make sure I didn't lose any steam going into that. As I began my last mile, I was 52 seconds ahead of the pace I had designated for myself, with a big hill staring me down. Somehow, though, I didn't slow down at all. I certainly didn't speed up, but kept my hips underneath me and I pushed myself right up the slope, doing all I could to maintain. As I crossed my finish line, I checked the watch. My last mile, uphill, had been 7:18. Overall, I'm pretty happy with the run, but I know that I've got to learn what my pace feels like to ensure that I don't overdo it again next time. I want to make incrimental improvement. I don't have to do it all at once, and if I'm going to stay healthy enough to see this thing through, running smart will be far more important than running fast. But it'd be nice if I was fast, too. Completing the marathon on Sunday made me feel quite strong and confident. The agony that followed in my legs caused me to lose some of that good feeling, but as the stiffness has cleared up, so has my vision of the next few months, and I've got some good times ahead of me. I registered for two races this week. The first, as I mentioned before, is the Seattle Rock 'N' Roll Marathon at the end of June. I'm excited to see a new city - really a new part of the country for me - and to experience the Rock 'N' Roll Marathon brand. My other registration was for the Marine Corps Marathon, or as it's often called, the "People's Marathon." They call it this because it is the largest marathon in the country that does not award prize money. This is not a race for professionals. It's for the people who want to challenge themselves to do something great. I lived in the DC area for a bit after college, and this was the one that everyone talked about. In one of my many spurts of "going to be a runner again" ambition, I'd planned to register for the race many times, but I'd never gotten around to it. I'm only partly to blame for that, since the thing sells out incredibly fast. This year it was sold out in 28 hours. That's like Super Bowl sellout speed, but with a lot more tickets. I'm even more excited about that one because my wife is going to run the accompanying 10K that day! Her training starts Friday as well. For the purpose of my goal, I'm counting the Marine Corps as a Virginia marathon, as that's where it starts and ends. A heavy portion of it actually occurs in Washington, DC, but I think for my own personal records, I'll use finish line location as the determining factor in where the marathon actually occured. Now, what all of this means is that I've got 17 weeks to train, then a marathon to run, then 17 weeks to train, and then another marathon. I've got my eye on a race at the end of November, but I'm going to get back into my training a bit to see how my legs respond to running after the marathon before I make the decision as to whether or not I can run marathons 4 weeks apart. Overall, I've been happy with my recovery, but I want to make sure that my performance doesn't suffer too much. Speaking of recovery, I'm pretty much there. I got on the bike at the gym yesterday and went for 35 minutes on the cross country course, making it over 8 miles. I was pretty pleased with this, and it really helped break up the remaining crap in my legs, too. This morning was the first day all week that I got out of bed without any pain in my legs. There's some lingering stiffness, but I'm taking today off (as Thursday is my new rest day, according to the new training program that I've found), so hopefully that last resistance will be gone by morning when I hit the roads again. The only thing that still really bothers me from the race is a toenail on my left foot that is really sensitive. I've found that letting my socks be slightly more loose in the toe helps a lot, but we'll see how I handle it tomorrow. That's what stands out to me as the things that held me back. Also, I didn't have a very good race plan in my head, which is something that I think my new training program will help as well. "Run smarter, not faster" is going to be a new slogan of mine. If I build my physical and mental strength, and I approach each workout intellectually rather than just going as hard as I can, I know it will go a long way toward getting me to my performance goals. After all, I've just signed up for two Boston qualifying races, and the qualifying time just got harder. Today is about two things. The first is a look back at the event surrounding the Livestrong Marathon. The other is a look ahead at what's next. I don't have too much experience with marathons as of yet, but I'll become something of an expert in them over the next couple decades, so I figure that I should do an official review of sorts for each one, if only for my own reference in the future. So, apart from my performance there at, here is what I thought of the entire event. We'll start on Friday, at the expo. I wanted to get there relatively early, before all the 5 o'clock people got off work and headed down. The goal was to beat the rush. I failed in said goal. Though it would be much worse throughout the rest of the weekend, traffic was already pretty bad outside the Palmer Events Center. Fortunately, they did have police support, and it kept things moving relatively efficiently. Sure, it took us a few extra minutes to actually get into the parking garage, but I felt that the information on the website aptly prepared me for what I needed to know. As for the expo itself, I was honestly a little disappointed. To be fair, it's mostly because I haven't been to one of these expos before and I oversold it to myself in my head. The messenger bag we got is nice, and it's timely for me, because mine is starting to fall apart. I was glad to get the Spibelt, though I hated actually running with it. I've got to figure out how to wear it correctly, I guess. I'll give it some more time before passing official judgement on it. That was really all the swag that we go. I've been to other expos for other industries, and they're passing things out all over the place. Everything at this particular expo was for sale, sure, but there was very little in the way of samples. I think I ended up with a honey-something bar and a Soy Joy. I did get some good information about a number of different upcoming races, including one that I'm thinking of signing up for in November, but we'll get to that shortly. 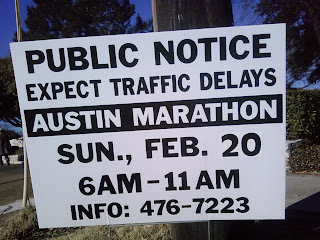 The Austin 10/20 sounds particularly interesting, even though it's not a marathon. Hey, I never said I wouldn't do other races, too. I think what I was hoping for were more item-specific booths. Instead of a bunch of retailers, I wanted someone from, for example, Saucony, or Garmin, or IronMan or any of the hundreds of brands of running merchandise that I have yet to explore. I can go to a running store any day of the year, but when I go to an expo, I want to talk with experts and get their opinions on the latest advancements in running technology, even if I can't afford them. But like I said, I've never been to one of these before, so I'm not sure if that's par for the course, or if this one was lacking. The bright spot for me was the packet pickup, which was clearly marked and far enough removed from everything else that there was no crowd and no problem. I waited about 90 seconds to get my number, and they had everything organized and waiting. From what I understood, the traffic on Saturday was absolutely brutal, with some people waiting as long as an hour just to get into the parking garage. This is less the fault of the marathon crew and more of the city, I suppose, but it's something to keep in mind. Now, for race day, I must say I was thoroughly impressed by the whole event. It seemed to me that everything was well-marked and that it had all been adequately explained online beforehand. To be fair, I just followed the crowd through most of the morning, but still, there didn't seem to be too much confusion. The course itself was very challenging, particularly miles 9-15. The bad part of my race came later, but it was because I spent what was left of my energy on those miles. For me, it was the rolling of the hills that burned me out. To say that it was hard does not, by any means, imply that I think it was a bad course. Though it got a little lonely on the backstretch, the course scenery was varied and interesting. There were some lonely miles, but for the most part, there was great crowd support, and I must say, I was thoroughly satisfied with the water stops. They were ample, well-staffed, and energetic. They provided boosts when I needed them most. There were plenty of toilets to go around, too, which can really make or break an event. Post-race, my only real complaint was that no one really told me where to go. If I hadn't run a marathon before, I might not have gone in search of a finisher's t-shirt. For my one suggestion to the Austin crew, I would advise the people handing out medals to direct the runners on what is next. Fortunately, I found my way after asking someone where they got their spiffy new t-shirt. The medal is fantastic. I got out my old Columbus Marathon medal when I got home, and the two don't even begin to compare. The shirt is great, though I liked the half-marathon finisher's shirt better. And it really doesn't get cooler than being congratulated across the finish line by Bart Yasso, Runner's World's Chief Running Officer. That was the perfect little finisher on a wonderful event. The Seattle Rock 'N Roll Marathon on June 25, 2011! This is very exciting to me for a number of reasons. First, I've never been to the state of Washington, let alone Seattle, so I'll get to spend some time in a place I've never been. We've got family up there, so that will cut down on the room and board portion of the trip. Also, I've heard great things about the Rock 'N Roll Marathon series, and I have a few of them on my list of races to run, so I'll get to see how I like it. Even more than that, I've found a new training program that I think will better prepare me for race day. It's an 18-week plan, and the race is a little over 17 weeks away, so you know what that means? Training starts Friday. Today I rested most of the day, and then we decided to walk the pup to doggie training class tonight rather than drive, so I got a 4-mile walk in (with hills) and I didn't feel like I was going to die. Tomorrow will be a bike day at the gym, just to get the muscles used to working again, and we'll see how I'm feeling come Thursday morning. Either way, I've got a five-miler on Friday to be ready for. I recognize that an ambitious goal is nothing without ambitious action, so I've set out a plan to do three more marathons before the year is out, two of which I will be signed up for by tomorrow. Seattle is first, and then comes the Marine Corps Marathon, which opens registration at noon (central) tomorrow. It sold out in 6 days last year, so I'm getting on it right away. This race will be approximately 18 weeks after Seattle, which gives me plenty of time to go through an entire training program again. But here's where it really gets interesting: the fourth marathon that I want to run this year is the Route 66 Marathon in Tulsa, Oklahoma, which happens at the end of November. That's only 4 weeks after the Marine Corps, but I feel by then that I'll be in such great running shape that a quick turnaround will be possible. I'm going to wait a couple weeks on signing up for this one, though, just in case I find that my recovery from Austin takes longer than anticipated. I'm still learning these things. So, there you have it. For the past, I give the Livestrong Marathon a B+. For the future, I'm coming to Seattle. And for the present, I'm going to sleep. Today has been an interesting day, leg-wise. I woke up about 3am incredibly thirsty. The good news was that I had anticipated this and put a water bottle on my bedside table. The bad news was that it required me to roll over, and when I did, my legs were on fire. The muscles in my legs, it turns out, are not amused by the choices I made yesterday. A couple weeks ago, I decided that I was going to really take it easy this week. My official plan was to run a 5K today, and then take one week off. I wanted to give my knees a chance to recover, for one thing. The nagging pains that have bothered me the last couple weeks are likely due to overuse, and the only real cure for that is to take some rest. For the last few weeks, of course, I couldn't afford to take time off, but now I've got a little bit of a break, and I figured it was time to recover. While talking with my mother (also a marathon runner) after the race yesterday, she recommended that I simply walk the distance today, rather than running it. She said that it would give me the opportunity to use the muscles and break up all the lactic acid and other pain-causing elements, while not stressing the muscles further. Boy, was she right. I went to the gym to just walk on the treadmill. I was having some issues with stairs and inclines in general, so the idea of running anything resembling a hill was not a pleasing one. With some difficulty, I staggered onto the treadmill and started it up. After about a mile, I decided that two miles would be more than enough. I mean, my legs hurt a lot, but they were moving pretty well. I even did a little bit of speed-walking just to mix it up, but it got boring quickly. To make matters worse, I managed to do this little exercise at the worst part of the cycle of SportsCenter. They spent half an hour discussing NASCAR and the NBA, two leagues that I do not care about, other than Go Bulls. The good thing was that I had decided beforehand not to run, because I couldn't have done it if I wanted to. Even the quicker walk (a whole 4.5 speed) was a little more stressful than my legs wanted to tackle, and I only did that in very short bursts. If I had gone into the gym expecting to run, I would have been severely disappointed. In fact, given the state of my muscles, I probably wouldn't have even made it to the gym. As it was, I completed my two miles in a very slow time, and was able to head back to the apartment happy with the progress. I was planning to rest all day tomorrow as well, but I think I'll see how I feel when I wake up. If I'm in good spirits and not altogether broken, I'll probably go get in a couple more miles and a good stretch. All in all, I'm taking notes about everything that hurts and how long it takes to recover. My quads, hips and the lower hamstrings (at the knee) are causing the majority of the trouble. As the day has gone on, I've had better luck with walking, and on a flat surface, you can hardly tell I ran a marathon yesterday. My only real issue is going down stairs. This has always been odd to me, but when your legs hurt, it's easier to go up stairs (which should be harder) than down them. Today, I needed support to get safely down the few stairs with which I interact, but everything else was well within my power. Once I'm back to strength, I'll give myself five days of not running. I'll probably do some biking and, if the weather holds, I might even take a dip in the pool. I figure that some low-impact strength work is a good way to build up the muscles around the knee without aggravating it too much. Then, I'm going to take the list of everything that went wrong with the marathon, which I'll put into a post later this week, and go to a running store to figure out what I can do better next time. Clearly, I need to develop a stronger race plan, but there are many technical things I can do regarding my training and equipment to make that plan easier to follow. Every race should teach me something, and this one taught me a lot. The hard way. It's even more important now, because I've got my eye on the horizon. If all goes according to plan, I could have three more marathons to do before the end of this year, one on each coast and one a little closer to home. So for this week, it's recover and plan. I'll detail my strengths and weaknesses from yesterday, and I'll give my overall review of the Livestrong Marathon, for what that's worth. So much to do, and so much time. Life is good. I have never been more excited to hear my alarm go off at 5:00am. I'll take some time in the next week to detail the expo and what I did on Saturday, but for today's post, I think I'll focus entirely on the Austin Marathon and everything that goes with it. For maybe the first time in my training, I was up with the first alarm, though I'm sure it helped to know that I also had alarms set for 5:02, 5:08 and 5:15, and I didn't want to keep hearing it go off, so I was out of bed on time at 5:01am. Last night, I had set out all of my things in anticipation of this morning's craziness. I had the shorts, t-shirt, socks, shoes, hat, Spi-Belt, and my number (with safety pins) all laid out in the bathroom, ready to put on. I started getting dressed, and had a protein bar, to make sure that I had something in my stomach. I also had some water. I spent a good portion of yesterday hydrating and carbo-loading, so I felt confident in what was in me. I double-checked all my gear, and attached my chip, which I still think is a really, really cool technology. Once dressed, I checked in on my online world, and then closed the computer. It was time to stop thinking of anything else. I put together a bag of post-race possible necessities, including extra clothing, band-aids and some food, and my wife (generously) agreed to bring it down to me. She would be coming down and brining the pup with her, so she could add a little weight to what she was bringing. Then, it was out the door. My brother-in-law and a friend of his were running the half marathon today, so he offered me a ride, which I gratefully accepted. I climbed in, and we parked downtown. We walked the last few blocks, and I split with the other two and headed straight to the start line. History has taught me that waiting too long to get up to the start results in being stuck well behind my desired pace group. I walked up right as they announced the opening of the starting gate, so I headed straight in. Now it was a matter of where I lined up. My goal of qualifying for Boston led me to the 3:10 group. My goal for this marathon was actually to finish in 3:30, but I have learned something about myself during this training season - with enough motivation, I can surprise myself. At least, I felt, if I started with the faster group, then when my legs began to get tired, I could slow down and hopefully fall in with a slight slower pace group. After a brief conversation with a man doing his umpteenth marathon, I began to sink into my own focus. I had my energy gels and turned my attention to the countdown clock. Thanks to my positioning, I wasn't too far back from the start line, and there was not too long of a difference for me between the start of the race and when I crossed the line. Per the course recommendations that I'd read, I started on the left, being careful not to get pinched by the three early right turns. However, I figured out pretty quickly that the crowd wasn't thick enough to really risk that. After the first turn, I made my way to the inside. I got in right behind the pace group and settled in. I knew that the wife and pup would be waiting at mile 2, so I got over to our agreed-upon side of the street and kept my eyes open. I saw her and hurried over to give a quick high-five. It helped that this moment was on a downhill, so I didn't lose any energy by ducking across the street. When I rejoined the group, I had passed the pace group. No worries, I thought. They'll catch up soon. I kept in my pace and moved ahead. I felt great. Even up the unbelievable hill that starts the course, I felt strong and very in control. Of course, this was the adrenaline doing most of the work, but still I was thrilled to be feeling that well. The crowd support was fantastic, and I couldn't have been happier. As Ben While loomed ahead, I knew today was going to be a good day. I was still well ahead of my desired pace, and the course was about to take a downhill turn. Using advice that the pace setters had given (lots of advice, today) I took it easy on the downhill. I didn't try to push my pace at all, choosing to stride out and maintain, which probably picked me up some time. Crossing back over the bridge, I was still feeling good, and even played to the crowd a little bit. The adrenaline rush was unbelievable. And, I got to see the wife and the pup again. I was 1/3 done, and feeling good. Then I got into the part of the course that I hadn't seen before, and things started to go wrong. I was still well ahead of my pace, but the hills started coming more frequently. While I'd been training on long, grueling uphills, I had not counted on lots of ups and downs repeated. Guess I didn't look at the elevation chart quite close enough. I wasn't quite out of breath yet, but as I turned toward the 13-mile mark, I hit the wind, and I hit the wall. I'd developed a cramp, so I figured I might as well take an energy gel. The only bad thing it could have done was give me a cramp, and I already had that, so I figured it was worth the shot. It was about this time that the pacing group finally caught up with me, because I was right on their pace. At 13.1 mile, I was at 1:34. For a while I had felt myself slowing down, and when the group passed me, I tried to keep up, but it wasn't happening. I slowed back to my pace and settled in again. About mile 15, I felt all the muscles in my legs start to weaken, and something else happened. I had to go to the bathroom. I've been asked several times how one avoids this issue, and the only real chance is to go right before the race, and hope for the best. I did not have the best today. I ducked into one of the many porto-potties on the course (really well supported race, by the way) for no more than two minutes. And when I started again, my legs were ANGRY. It took a few minutes to run the kinks out of my legs and get back into my pace. Thus began the unhappy part of my race. Basically, it consisted of pain, having to walk a few times, and some level of frustration. However, I did stop and take stock of my situation. I hurt, but I wasn't exhausted. I had ten more miles in me. I was sure of it. I wouldn't make a qualifying time, and I might not make 3:30, but as I have said, this race was about finishing and learning. At mile 18, I had a major problem. (This part may not be for the faint of heart.) We saw a t-shirt the other day that said, "You're not a road runner if you still have all your toenails." Two of mine (one on each foot) have been black for a couple weeks. This is because of blood blisters that develop beneath the nail and appear to change the nail's color. A few feet shy of the 18 mile marker, I felt a surge of pain in my left foot, on my bad toe. Having never felt this sensation before, I came to one conclusion: I had just lost a toenail. It stung unbelievably, and I had to walk for a bit, but after a mini pep-talk to myself, and a water stop, I told myself that I had no other choice but to start running again. What was I going to do? Walk the last 8 miles? Absolutely not. So I started again. Once I got over 20 miles, I knew that the end was approaching. There was only a 10K left. I could do a 10K. Time tended, by this point, to blur into itself. The next thing I really remember was mile 22, where I felt the nail on the other foot go. I let myself suffer for a block or two, and then I started running again. The last four miles involved a fair amount of walking, I'm sorry to say, but they did contain a few great moments. First was the gentleman who, with roughly 3.5 miles to go, came up to me as I was walking, slowed, and said, "Let's go." I smiled and did. With about a mile left, I was walking again when a man on a bike smiled at me and yelled, "There's no walking! This race is in your head. There's no walking there!" Again, I smiled and started running. I did not walk again. Up the final hill, with 800 yards to go, I came up on a man who did not look like he was going to finish. He was doing the leg wobble that we've all seen on hard-to-watch race videos. I waved for someone from the sidelines to come and I put my arms under him. We tried to get him to the sidewalk, but he turned to me and yelled, "Keep running!" The guy from the sidelines took him, and I finished the hill, which led into the final turn. I started clapping, and I could not stop smiling. The clapping made my watch band break, and someone from the crowd ran out and grabbed it from the ground. I got it from him, thanked him, and turned back toward the finish. One last little moment of hilarity on this journey. With a cheer from my wife, I made the final turn and sped into the finish. I raised my arms and crossed the line in victory. From there, here are the CliffsNotes for the rest of the afternoon: I got my medal and my finisher shirt, though I actually liked the half marathon finisher shirt better. It's fine though, because the medal is awesome. I couldn't walk home, so my brother-in-law gave us a ride back. I had some food and, most importantly, I had a nice, long shower. Getting ready for the shower, I was slow to take off my socks, scared of what I was going to find. And here's the really good news: I still have all my toenails. Apparently the blisters beneath the nails just burst, but the nails are alive and well. Well, I think this post is long enough at this point. I'll be taking about a week off running, though I'll do some biking and walking to help the muscles recover, so I'll give more information about the time around the race soon. For now, I sit happy to have finished, if not quite at my goal time. I have a lot to work for next time, and I am sure that there will be a next time. Life is good. So is pasta. I'm going to eat some more. As the last few hundreths of a mile ticked off the treadmill this morning, I started smiling very broadly. Just like that, I had finished my last training run for the Austin Marathon. Nearing the day of the race, there are two things that are very different when compared to the last marathon I ran. The first, and most important, is that I actually trained this time around, which changes everything. I don't remember a whole lot about the days leading up to Columbus, but I know I did not have the physical strength that I have cultivated over the last twelve weeks. I was running solely on the basis of the fact that I'd always been able to make my body do what was needed of it. I could run all day as long as I paced myself and didn't stop. This time around, I know I can make the distance because my body is conditioned for it. My legs are strong. My cardiovascular system is up to the challenge. I barely lost any breath on my run this morning. I am physically ready. The other thing, almost as important, is that I am mentally ready for one major reason: I know I've done this before. And that was without the aforementioned physical readiness. I really believe in myself this time around. It's more than a novelty "thing" that I'm doing. This is not just to say that I did it. This one is to be better and to build a strong base for a long journey ahead. I'm so excited, I can hardly contain myself. I've had trouble focusing on anything else the last couple days. I have to keep refocusing myself in things like work and rehearsal. This will happen any time you spend a significant amount of time preparing for something and then realize it's almost there. I was looking at my training record today, and I had such a sense of accomplishment that, regardless of the outcome on Sunday, I feel good about this season. As long as I finish, I'll be content. That being said, I do have some goal times that I'm hoping to make, and I'll be disappointed a bit if I don't hit them. If I'm going to qualify for Boston, especially since they're screwing with things now, then I've got to get on pace for that. But that's not what this Sunday is about. This Sunday is about my rebirth as a runner. It's about my rededication to the sport. It's about me. One more workout between now and the Austin Marathon, and I couldn't be more excited. I really feel as though I'm ready for this one. I've done my training. I've researched the course and given a lot of thought to my race plan. I feel extremely confidant. Which of course makes me very nervous. It makes me think about all the things for which I might not have prepared. What if I get slammed into a crowd early on and don't have the chance to break out into any kind of pace? What if my shoelaces break? What if absolutely everything goes wrong two miles into the race? Okay, I'm not panicking. I am, however, trying to make sure that I'm ready for all of those things, as far as I possibly can be. As long as I cross the finish line, the day will be a success. It really doesn't matter to me how long it takes me to complete the thing. I have a time that I would like to beat, but if I don't make it this time, I've still got many races ahead of me to improve. There are only a few things that I am genuinely concerned about. The first is that I won't wake up on time. I still have issues getting up on time for my daily runs, and mostly it's because I don't absolutely HAVE to get up early. I can schedule my run throughout the day, so I don't really have the urgency that is required to actually get me out of bed. For really important things, though, I'm usually pretty good about getting myself in motion. Still, I'll probably have trouble sleeping that night because I'll be so excited, so I've got myself a little concerned about that. Once I'm standing in the staging area, I'll feel a lot better. Then it's just a matter of enjoying the ride. All this was going through my mind as I did my last outdoor training run this morning. I took the dog with me, and she ran along the entire way. There were only a few points where she gave me any sort of trouble, and for the most part it was because there were other dogs around, and when that happens, her attention span goes to zero. I really don't remember much about today's run at all, because I was so focused on Sunday. All I know is that the pup did well, and actually managed to tire herself out a bit. 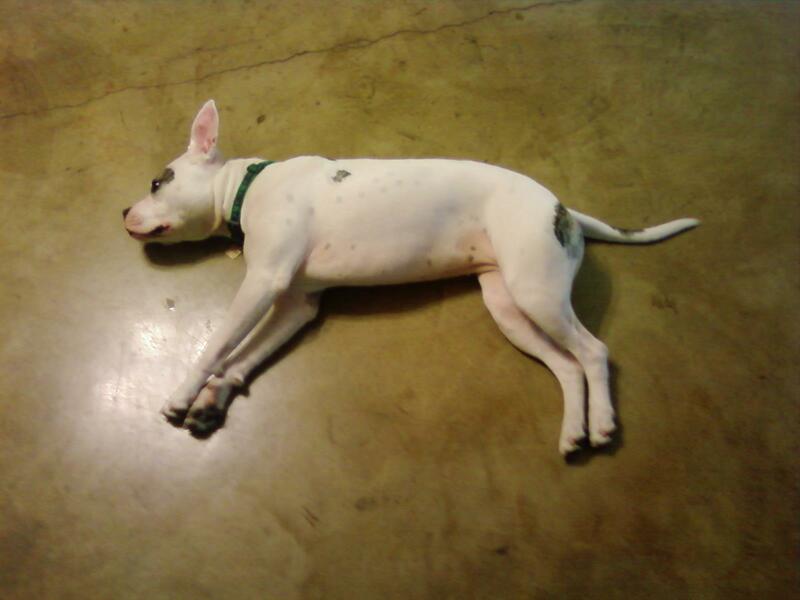 Fortunately, we have a concrete floor in the apartment that she uses to cool down. I'm also really excited about the expo tomorrow. I've been to a few expos in my life, and most of the time I'm there as someone else's guest, and I've had really no idea what any of the stuff they were peddling meant. This time, I'll actually have an opinion on what they're offering, and I could learn a lot of new things. Plus, I'm excited about the swag bag. ...and one eye on the ground. I didn't have anything on my workout schedule for today, so I spent my time thinking about Sunday and all the choices that I have to make between now and then. Choice number one has really already been made - what to wear. Since my wife wants to be able to see me on the course, I went out and bought a bright green shirt for race day, along with an actual pair of running shorts. Thus far I've run in my "exercise shorts" which are really intended for basketball. They serve the purpose, but on extra long runs, they run the risk of chafing. Learned that the hard way. I've got my running hat, because I can't stand having my hair in my face while I run, and of course I've got my shoes. I'll probably have to look into getting a new pair after the race. I did some adding the other day, and I saw that I've put over 300 miles on those shoes in the last 11 weeks. They're holding up pretty well, but I'll want to keep an eye on them. I even know which socks I'm going to wear on race day: the ones that are short but not so short that the back of my shoe can find the skin on my heel. I know what I'm planning to eat beforehand (an orange and energy gummies), I know the stretches that I want to do, and I know what pace I want to shoot for. Most of the decisions that I have left to make are little intangible things, like what I'm going to eat the night before, or how I'm planning to get to the race. I could walk, but that would mean getting up even earlier than I already am, and I don't want to risk not getting enough sleep. We could drive, but I worry about how much parking will be available. I guess we'll see how we're feeling the night before and then make the choice. One thing that I am very conflicted on is whether or not I'm going to listen to my iPod during the race. On the one hand, it is allowed in this race, and I've been using music for most of my training. I've put together the beginnings of a marathon playlist, designed to let me know my approximate pace without having to check my watch. I could use the rhythm of the music to keep myself on pace and focused. On the other hand, there are all sorts of things that I could miss by having the headphones in. I might find someone out on the course who shares my pace and is fun to talk to. That makes the whole thing go a lot more quickly. There will be bands all along the route, and I would be able to hear them from far away. Most importantly, I'd be able to hear the crowd and their cheering all along the route, and it is impossible to overestimate the adrenaline rush that an audience can give. Yes, for all the pageantry of the event, it would be nice to be able to hear everything. I worry that it will get lonely at some points of the course, but it is unlikely that, in a field of 6,000 marathon runners, I'll be running without someone around me for any real length of time. I think I've actually made my mind up while writing this. At least for this marathon, I won't be wearing my headphones. I'll still take the iPod (because it's got a stopwatch in it), but I'll leave my ears open to the possibility of the road. Who knows what I might encounter out there? 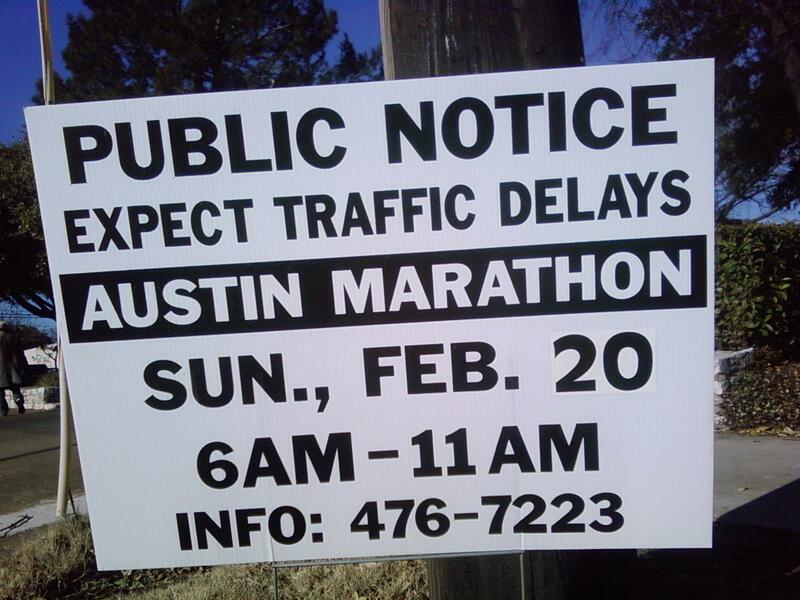 I did get a better idea of what to expect from the Austin Post's marathon course description that the race organizers have been tweeting out. 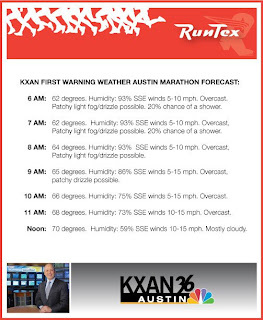 If you're interested in the whole thing, here is part 1 of the Austin marathon strategy guide. Honestly, I got so excited reading the second half today that my heart rate actually increased. Particularly in the final bit, I could visualize the entire thing. I can't wait to read the last part tomorrow and see myself coming across the finish line. Actually, I can't wait for Sunday to ACTUALLY cross the finish line, but time is funny that way. It goes slower the closer you get to what you want. Which, incidentally, leaves plenty of time for the weather to change its mind. But I hope it doesn't. I managed to get out of bed by 6:15 this morning, and it felt great. Eventually. My body was still fighting this whole endeavor of mine, but I managed to stay awake long enough to get my feet on the ground, and once that's done, it's just about staying in motion. I got dressed, had a good stretch and then went back into the bedroom to get the pup. Even with the recent trouble she's caused me, I haven't given up on running with the dog yet. I've just got to make it more of a consistent event so that she gets used to it and, hopefully, gets excited about it. Since I don't have any runs over 4 miles this week, I thought I'd take her out a couple times to see if she'd come around at all. We've tried several different products when it comes to taking our little pup for walks, to varying degrees of success. At first, we tried a rear-hooking harness, which evidently is a very bad idea for dogs that like to pull. Though it holds better than a collar, it actually encourages the pet to pull forward, unless you have a limitless supply of time and patience to keep them from doing that. I do not have these things, so on our trainer's advice, we tried a couple different methods. One is a shoulder harness that hooks in the front. This way, if the dog pulls at all, the harness forces them to change direction, which discourages the behavior. That's been pretty good for walks. The other thing we tried is called a gentle leader. It looks like a muzzle, but it does not work like one. It hooks around the dog's nose and mouth and around the neck, but it doesn't restrict any mouth movement. The dog can still bark, eat, lick, and do all the things that a muzzle would prohibit. What makes it effective is that the leash actually hooks under the dog's chin, which means that if the dog pulls, her head is directed toward who or whatever is anchoring the leash. This last device was recommended for workout days. It keeps the dog focused on what we're doing, and (hopefully) keeps her from weaving in and out of legs or wheels or anything like that. 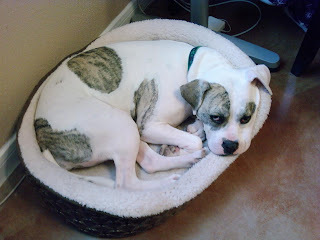 The downside is that our little boxer hates it. This is, of course, because it does exactly what it is supposed to do. She'd rather be running amok, chasing other dogs and having no regard for the world around her. When she pulls against the leader, it can get tighter, which only makes her hate the thing more. It has done wonders for her ability to walk with us, but on the runs, she's starting to get rebellious. So, I decided that I would just try her other harness today, to see if that got her more interested in the run. For the first quarter mile, she was absolutely insane, doing all the things the gentle leader is designed to prevent. It was much more difficult to control her, but she seemed happier. Then, for about half a mile, she was doing her usual routine of pulling back and actively showing disinterest. Right about the moment when I decided it was hopeless, she broke into a run and stayed next to me for the rest of the workout. It was just that sudden, and I was really happy. Even stopping for traffic and restarting was easier. I'll try with the harness again on Thursday, and hopefully I've got my running buddy back. We ran a little slower, but there were a few, uh, business stops along the way which affected the time a bit, and to be honest, I wasn't really concerned about time at all. The important thing is that I keep the legs moving this week, and anything beyond that is just icing on the cake. Really, it was one of the more enjoyable pup runs I've had so far. The only downside was that it was surprisingly hot. At 6:30am, when I made it out the door, it was already 62 degrees and humid. 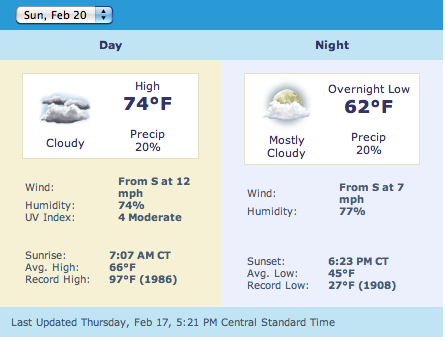 The weather in general has been pretty volatile down here, yo-yoing from 75 to 20 and back a few times. We've had snow, rain, and I think a little sleet at one point, and as we get closer to race day, I start to get a little more nervous about the weather. As of an hour ago, they were still predicting thunderstorms. Now, it's saying a high of 72, low of 57 and cloudy. A little warmer than perhaps we'd like, but definitely doable. I'm not getting my hopes up just yet, though. I won't really trust the forecast until Saturday. But I'll still be watching. I can hardly contain myself at this point. Every couple hours, I check my countdown clock to see how much time I've got left before the marathon starts. I find myself thinking things like, "Six days from right now, hopefully I'll be at the 10-mile mark." There's a nervous energy surrounding me, and it's got me completely wired. As a result, I had some trouble getting to sleep last night, which meant I had some trouble getting up this morning. I was still up in time, but then I had to rush through my shower, and I didn't get the full breakfast I should have forced myself to sit down and eat. This week, more than ever, it's important that I develop some sort of routine in all the things I do, especially with anything related to running. I'm going to start searching for tips on making myself get out of bed on time. I've tried all sorts of things in the past, most of which just annoyed my roommates. I think it's mostly a question of motivation. Maybe I need to have a better reason to get up early than "to have more time." You see, when I first wake up, my brain is not very good at making arguments. "Get up," says my brain. "Because you want to run and get ready for work with plenty of time." "I can sleep another hour and still do all of that," says the body sleepily. Brain thinks for a moment. "But you said you wanted more time in the morning." "Well, for whatever you want to do." "In that case, what I really want to do is sleep for one more hour. Goodnight brain." And I've bested myself again. It also doesn't help that there's a 30 degree swing from day to night temperature outside which leaves the bedroom cold every morning. It's not easy to throw off the nice, warm covers when you know it's going to be uncomfortably chilly. For the rest of this week, then, my focus will be on the fact that if I oversleep on Sunday, all my training (and the money I spent) will have been wasted. Therefore, I must train my body that the snooze button is not an option. As a "reward" of sorts, I'll have an extra hour in the morning which I can use to write my blog post, and then get started on my day's work. The earlier I start, the earlier I'm done. And that should be worth waking up for. When I actually did get out of bed today, I headed to the gym for my weekly 5K, but true to the taper, I didn't push it too hard. In fact, I kept at a 7:30 pace the entire way. The down side was that it was a little more uncomfortable than normal. My legs felt stiff and a little weary early on, and even though I wasn't all that winded at the end, I didn't have the drive to do my normal follow-up work in the gym. I think there are a couple reasons here. The first, I've already mentioned. If I don't make myself get up, I lose a lot of momentum early on. The second is that I had a rehearsal in a tepee yesterday (of all things), and I sat cross-legged for the better part of four hours. Not a great plan in general, and certainly not after a 9+ mile run. Finally, I didn't stretch out beforehand, and this is really the key to feeling good at the end of the run. It's something I've been bad about during this training season, and I'm going to try and focus on it more in the weeks and months ahead. Longer stretching, better warm-ups, stronger workouts. In addition to all of that, I'm just impatient. Eleven weeks of work is all coming down to this Sunday, and I'm ready for it to be here already!! I'm excited for the expo that goes along with the race as well. I'm always interested in new running gear and gadgets. I'm looking for a good mapping and timing system. I know Nike has one, as does Adidas, but I'm not 100% sold on either one. I hope there are some good options at the show. I'm also really excited for the swag bag. They've listed out a few of the things that are included already, and I'm pretty pumped about them. Once I've got everything, I'll take pictures and put it up. Hey, if you're going to spend $100 or more for a race, you really should get some cool stuff out of it. I could go on and on about the things that have me pumped this week, but then I'd have nothing to write about for the next five days, so I won't go too far into it now. Suffice it to say that this is as excited as I have been about physical activity since high school, and I'm counting the minutes until then. And watching the weather. Isolated thunderstorms, 74/59. Taking some advice from a column posted by RunTex the other day, I decided that this morning would be a good time to take a look at the beginning of the actual marathon course. 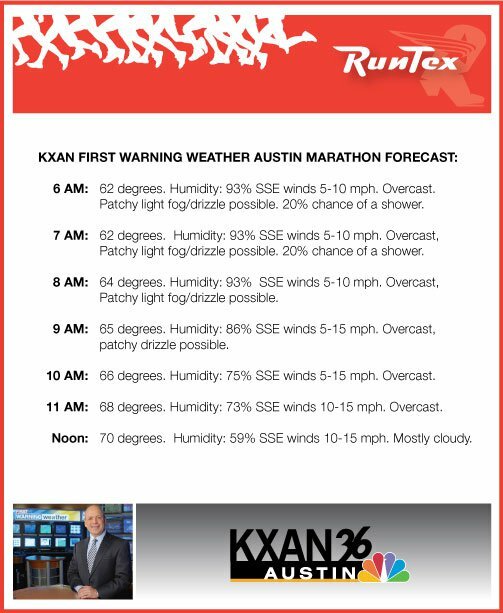 You see, while reading the article, I noticed that it cautioned those running next week's Austin marathon to beware of the first few miles, as they go uphill. How bad could it be? Answer: bad. At least, it would have been, if I had come across it on race day without any warning. I've driven down that street many times, and I've never noticed how steep the grade on it is. The good news is, with every uphill comes a downhill. That is, even though there's a pretty rough hill right at the start of the run, it's followed shortly by a long, substantial downhill. I'm really glad that I took a look at that part of the course. I've been focusing on the end of the race, figuring that's where I'm going to have all my trouble, what with the 20 miles I've already run, but I need to watch out for the beginning of the course, too. If I don't pay attention to the level of difficulty early on, I run the risk of burning myself out early on, and at that point, it doesn't really matter what happens next. Even facing the hills, I had a pretty strong pace for the whole run. There was only one point at which I had any issues, and it was up a VERY steep hill (not on the course) that I used as a short cut to keep my mileage down. And then Mumford and Sons came on the iPod. I was thinking about the concept of a "hero song." It's a song that comes on at exactly the right moment and has exactly the right feel to it. Whether it's a great rage song when you're upset about something, or a happy, energetic 80s song when you need motivation to start your drive to work. Today, my hero song was Awake My Soul. It's not a fast song or by any means rock and roll, but it's got a great, full sound, and for a reason I can't describe, it was perfect for the moment. It brought my mind back into focus and got me up the hill. And it was great that I had something to help me out, because as I ran, the temperature increased rather quickly. In fact, from when I left for my run to when I got back, it went up by 15 degrees. But as I made my turn and started the downhill stride, I let my mind wander to next week. I thought about what it's going to be like coming across that finish line. When I completed my first marathon, I did it without training. It was spur-of-the-moment, and as a result, it didn't mean all that much. Yeah, it was great to have completed one of the most grueling physical challenges a person can do, but there was very little invested in its accomplishment. This time around, I've been training for 10 weeks. I've put time, effort and money into this thing, and when I cross that line one week from today, there will be a real sense of accomplishment. So, this week, I've got plans. We've stocked up on pasta, and I've got my energy supplements ready to go. I tried some PowerBar energy gels today, and they were great. I'm running at a steady pace for no more than 4 miles between now and race day. My two three-milers will be on the treadmill, making sure that I keep at my newly adopted 7:45 goal pace. My four milers will be with my reluctant running partner. She's pretty excited about it. As the marathon nears, I find that I have a lot less patience for the training runs. I'm so excited to actually finish the big race, that the short runs in between, though wholly necessary, are beginning to feel repetitive and dull. As a result, I'm always excited for something that changes up the routine. This is part of what makes the Friday runs with the dog so enjoyable. Or rather, what would make them enjoyable if the dog had any interest in running. The first few times we went out on the roads, she was excited. She really seemed to enjoy the workout, and she was much more calm throughout the rest of the day. The last couple runs we had, though, she didn't seem to like it. 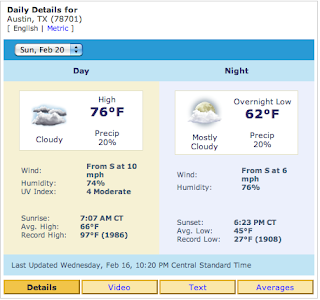 I thought it was the weather, but this week, the weather was great. It was sunny, and the temperature was finally solidly over freezing again. Really, it was a great day for a workout. We got stopped by a couple stoplights at the very beginning, so we didn't catch any kind of pace until a quarter mile in or so, and by then she had figured out what I was trying to do. And she wasn't having it. She did a lot of grass-rolling, her general sign for "I'd rather be sitting still." When we were stopped at a traffic light at the bottom of the hill (about 1.5 miles), she stopped, looked at me, and flopped on her side. Part of me was just worried that she didn't have the energy for this, but she didn't seem to be tired out. She wasn't panting, and when she got started, she could keep up with the pace without any problem. It just appears like she's not interested in jogging as an activity, and would much rather be doing something else. Anything else, really. It really started to bother me on this particular morning. I try not to let it get to me, since it's more important that I complete the miles than that I run them quickly, but it can get frustrating. What had once been a fun activity for me and the dog is now beginning to feel like a chore for both of us. I'm hoping that in the coming weeks, as my mileage decreases, that she'll be more excited to do shorter, faster runs. As of this Friday morning, though, she didn't get excited about working out until over three miles in. I worry about what other people think when they see me running and a little pup jogging behind, doing her best to look pitiful. It's important that she get her exercise, and since she's not trained enough to go to off-leash parks yet, running is her best bet. Our dog trainer recommended getting bikes, but if she's lagging behind on a run, will she be able to keep up with a bike? Maybe I'm just not fast enough for her. I suppose that's a possibility, too. It'll just be a wait-and-see situation with this. There are a few things that absolutely must happen, and we will make them work together as best they can. Our dog must get more exercise. I must continue my training. So, for now, the dog must run with me, and I'll just make sure to keep it consistent and (hopefully) enjoyable for both her and me. In other news, I've been watching the ten-day forecast with great interest for the last few days, watching the general trends in an effort to anticipate race-day conditions. 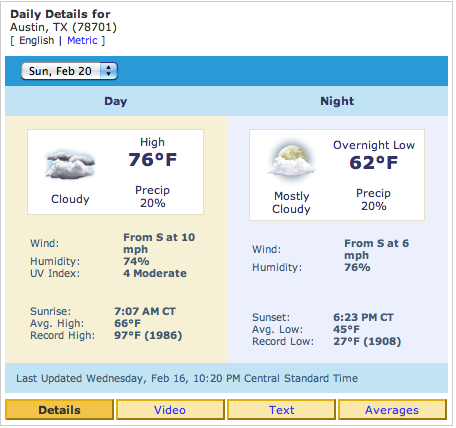 Then, yesterday, February 20th finally showed up on the ten-day forecast, and for an hour or so, it looked good. High of 71, low of 55, cloudy in the morning, sunny in the afternoon. Perfect weather. A little too perfect. I think what I love most about running is the fact that it really helps me bring everything else that is happening in my life into better focus. For some people, these moments of clarity happen on the toilet. For others, it happens after a beer or twenty. For me, it happens around mile four. It could just be that the long runs give me a lot of time to think, but I believe there's more to it than that. In addition to having quiet moments of reflection, I push my body and burn off a great deal of energy. I've always had a lot of energy. When I was training to be a teacher, my trainers remarked that I'd be great, if it were possible to keep up my level of excitement for an entire class session. When I did just that, they weren't sure how to respond. There's a downside to being overly energetic, of course. Besides the fact that I often talk WAY too much in social situations, my brain shifts topics and moods rapidly, too, often leaving me exhausted just from my own wandering thoughts. I'll give you an example. Before I know it, I've got seven different windows open on my computer, running half a dozen strategies for four different clients, and I won't be getting anywhere near as much done as if I had simply worked my first idea to its end and then moved on. What does that have to do with running? The problem here is that I've got an abundance of "get up and go," but I've taken no time to get focused. I probably slept in, so my body's rested, but I overslept my sleep cycle, so I'm groggy. I haven't taken a shower yet (why bother if I'm running later), so I haven't cleared my head at all. And, I haven't eaten the high-protein food that I have after a run, so I probably had something with a heavy sugar base, setting myself up for a crash. So now, I sit at the computer and realize that I've gotten completely off-track, and I have been listlessly roaming through my work all day. Yes, I'm getting the job done, but it's not up to my standards, and I can do better. I take a breath, put up an away message, and take my lunch break. Then, I'm back. I've had a shower, some good protein, and a strong workout that uses a lot of energy, but somehow gives me more. Instead of the frenetic energy of sugar, however, it's a focused energy that lets me get things accomplished. When I can do this first thing in the morning, I know it's going to be a good day. If. If I can do this first thing in the morning. I wanted to do a treadmill run today for a couple reasons. The most obvious was that the temperature had dropped here once again, and I wasn't really up for a freezing cold workout. But also, I wanted to take a stab at staying on Boston pace for the whole 8 miles, just to see how it felt. I should have been planning a pace this entire season, but I've been so focused on finishing that I haven't spent any extra energy in developing a consistent goal pace. If I could do 8 miles at Boston pace without any problem, maybe I could do more. The first two miles were great. So great, in fact, that I decided to increase the difficulty of the run. I reached for the speed buttons, but stopped myself. I didn't need to run any faster than the pace I was on in order to achieve my goal. What I did need to do was to run this pace on hills. That is the one thing that I always neglect in my treadmill runs, and if this pace was going to mean anything, I needed to be able to maintain it uphill. So I increased the incline to 3, and I ran uphill for two miles. And when I had finished, I could not wait to be done. I dropped the incline back to zero and caught my breath a bit. The exercise affirmed for me that I am not yet ready to tackle Boston pace for an entire marathon. And why should I be? This is only the second marathon of my life, and the last one was over 8 years ago. Where is the beauty of setting a goal for yourself if you don't have to work for it? Of course I'm not ready for that pace yet, but I think I can get closer than I'd originally planned, which is a victory in itself. Around mile 6, I vaguely considered bumping up the incline again, but a sharp pain in my leg said otherwise. I'm still not quite sure what it was, but it made me stop for about a tenth of a mile, and when I started back up, I slowed my pace by about 15 seconds per mile. It didn't bother me much for the rest of the run, but I wasn't going to push myself any harder than I needed. I think, at this point, I'm planning on starting out at a 7:30 pace for the marathon. That's about a 3:15-3:20 marathon, if I can keep it going the whole way, but this way if I need to slow up at all, the slower pace will still be within the time goal I set for myself. This Sunday, I'll be running the first part of the course for the first time. I hear there's a steady incline early on, which will be good to see first-hand before the race. After that run (and tomorrow's run with the dog), I'll be in full taper mode, going for several short, easy outings to give myself a little rest before the big day. And tomorrow, the big day will be on the ten-day forecast. I realize that it's far too early to start thinking about the end of my marathon journey, but during my second run yesterday, I started to muse over marathon number 50. No reason, really. Sometimes my brain just wanders from one topic to another, and even if you asked me, I probably couldn't tell you how I got from point A to point Z. So, regardless of how I got there, this is what I was going over in my head in between gusts of wind. I wonder which race I should save for number 50. Should it be one of the more exotic locations? It won't be Hawaii. I know that, because I'm not going to wait that long to get to Hawaii. I've always wanted to go, and that's one of the goals for this year. Now, whether I'll run a marathon in Hawaii this year remains to be seen, as I don't want to spend my vacation concerned with a race. But still, I feel like that is one of the races I should do sooner, to be able to fully enjoy the island around it. Alaska could wait until then, I suppose. I have no other reason to visit Alaska, outside of general curiosity, so that one could be put on hold. On the other hand, I kind of want the last one to be a "big deal" marathon. New York City would fit that description, but I was considering that one for next year. I have a number of friends who currently live there, and it would give me a great excuse to catch up with some folks that I haven't seen in quite some time. One suggestion that I really liked was to run an encore race in Dublin, Ireland. Once I've completed all fifty states, I'll do one overseas before (most likely) retiring and never running again. In the meantime, I really want to start hammering out a schedule, but at the same time, I'm very wary about getting ahead of myself. My best course of action is to do nothing regarding the future of this challenge before I get through a race. That leaves me about 11 days (notice my spiffy new countdown clock at the bottom of this page) before I have to make any further decisions. A lot will be dictated by my job as well. With irregular performance dates throughout the year, I'll have to be careful about when I schedule myself to be in other parts of the country. A great example is this June, when I would love to be running the Sunburst Marathon in South Bend. I'll be in a production here in Austin, which makes traveling to Indiana a little difficult. I can't even really plan anything for late summer at this point, because of some possibilities on the horizon. All I can hope is that, assuming these possibilities fall through, there will still be time to register for whatever race can fill the time. I am almost definitely planning to run the Marine Corps Marathon this October, and there are 37 weeks between Austin and then. I feel like I should do something in between. And I'm thinking too far ahead again. When I was a freshman in high school, there was a senior on the cross country team who seemingly trained nonstop. My mother was out driving early one morning and saw him running hills. That afternoon, she came across him running through the neighborhood. She rolled down her window and said, "Phil, do you just run morning, noon and night?" "Well," he said, "not noon." I remember football players talking about two-a-days as the most grueling, painful days of their year. Knowing that I had two runs today, this was all I could think about. Of course, two runs by myself do not even compare to a football practice, but it's still not something I do every day, and anything new runs the risk of being bad. As the workday came to a close. I looked over at my wife at her lovely new desk and asked her if she'd mind running 6 miles for me. She didn't seem interested. So, once again, I suited up. Heading down the hill, I noticed a big change in the weather, and that change was wind. 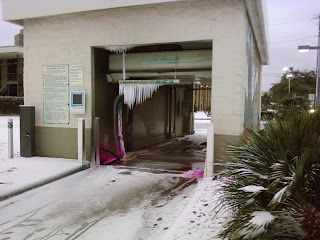 It was not as bad as some of those really cold days, but it was much stronger. It was one of those days when a gust actually makes you change direction a little bit, and no matter which direction you're facing, the wind seems like it's blowing in your face. The most important thing to me was that I not burn myself out too early. I wasn't sure how my legs were going to react to this change in routine, and I cannot risk injury this close to race day. Fortunately, fighting against the wind took all of my attention away from any other issues that I might have had. In fact, at several points during the workout, I had to take my hat off for fear that it would blow into the lake. My knee pain flared up a few times, mostly going from downhill to uphill or vice versa. Once I got into the rhythm of the new incline/decline, it faded pretty quickly. I settled into my pace and really didn't have any trouble keeping it up, which was surprising even to me. I felt good. At least, good enough to keep moving. I got stopped at one intersection that always gets me, and I took a quick look at my watch, when I found that I was way ahead of the pace that I thought I was running. Quite the pleasant surprise. What I learned today was that I am capable of just about anything, as long as I don't over-think it. I outran a treadmill by counting my steps. I ran better-than-race pace for six miles because I was worried about losing my hat. I think it'll come down to how I'm feeling that morning. If it's anything like I felt today, I just may go for it. The time for planning is almost over. After Sunday's little moral victory, I was really excited for my Monday morning 5K. There was one little problem, though. Twenty miles makes your legs hurt like hell. So, even though I was awake, I didn't get out of bed for my Monday morning run, figuring that if I waited until later in the day, I could shake some of the rust out of the muscles and really give it a go. But, as often happens, life intervened. My wife asked me to help her with a little errand. She wanted to go and pick up a new desk so that we could finally set up the office in our house. Both of us work from home, and we wanted to have two desks in the same room for a number of reasons, not the least of which is that, at the end of the day, sometimes you need to be able to shut the door and walk away. We figured the whole operation would take about two hours. We had to drive to her sister's house to get a bigger car, then up to Ikea, back home, back to the sister's, and then home again. No problem. No problem, of course, if there is no traffic. And if there aren't accidents on every reasonable passage through town. And if things are easily marked and in no way idiotically organized at Ikea. Needless to say, it was not the quick out-and-back that we'd hoped. About 4.5 hours later, we finally got home. Now I had a bit of an issue. I was really hungry, but I had a meeting in about an hour and a half, and I didn't have time to both eat and run between when we got home and when I had to be there. I chose to eat. There was no point in trying to exercise with no food in my system. My meeting (of course) ran long, so I ended up getting home kind of late. I had two options: I could run right then, or I could do two runs the next day. While two workouts in one day is not ideal, neither is working out right before bed. I figured if I were to head to the gym that late, I wouldn't be able to get to sleep any time soon, and then I wouldn't have been rested enough to do the 6 miles that I need to do today. So, I have opted for a two-a-day. The first step in that was getting myself out of bed on time this morning. There is no fighting it today, I had to work out in the morning, because I already have a workout scheduled for later. I thought for a minute about pushing everything back a day and just skipping my Wednesday rest, but I see from the forecast that they're predicting freezing rain tomorrow, and, well, that's just not happening. So, up I got, and after stalling for 20 minutes while someone else finished his run on the treadmill, I got on. I'd stretched out and warmed up my muscles as best I could, but I knew today was going to be really tough, so I had to psych myself up a little bit. Today was the day that I outran the treadmill. I hit Quick Start, 10.0, and I started running. Mile was was pretty brutal, particularly from .25 to .75 while my legs tried to figure out just what I thought I was doing. And yet, pretty soon, my legs fell into a comfortable pace. While it was by no means easy, I was able to maintain that pace without too much of an issue, and I was able to defeat one of my interim goals. I'm not quite celebrating yet, mind you. I've still got 6 miles to do this evening, and I'm very interested to see how my legs will respond to that. They feel better right now than they did when I woke up, so I'll take that as a good sign, and I'll choose to be optimistic for this afternoon. And I'll hope that doesn't change. There is not secret ingredient. So sayeth the Kung Fu Panda. For something to be special, you only have to believe that it is special. To be able to run 20 miles, you need only believe that you can. Today was the workout that I've been dreading for several weeks. For only the second time in my life, I was going to run over 20 miles today. I mean, that's an irritatingly long drive, so the thought of running it by myself first thing in the morning was a little intimidating. But you know what? In two weeks, I've got to run that plus another 10K, and there is not getting out of that, not once I've committed myself. So today, come hell or high water, I was going to run over 20 miles. This gets a little trickier when you have a full schedule. Doing some quick math, I figured that the run would take me somewhere in the vicinity of 3 hours, and I had somewhere to be at 11. Taking into account a shower, the drive, and a bit of recovery time, I had to leave the house at 6:00 this morning, no question. As a result, I didn't sleep very well, waking up at 3:30, 4:30, and then - as planned - at 5:30. I wanted to wake up with time to get a little something to eat (Marathon Bar) and get a long stretch in before heading out the door. Somewhat miraculously, I was out the door right on time at 6. I decided to run with the knee brace today, just to see how much it helped. I tried for a couple minutes last weekend, but it felt uncomfortable and I dropped it only a couple of blocks in. This morning, I gave it a complete try, and I will never wear it while running again. Don't get me wrong, it did help some, but oddly, it made my knee hurt earlier in the run, and then the pain went away. It popped up a couple times, but overall there wasn't enough of a difference that it is worth being uncomfortable the entire time. I love running before sunrise for several reasons. It's quiet, it's cool, and, most importantly, there are very few cars on the road, so that even if I am stopped by a traffic light, there is a high likelihood that I can just run through it. My iPod made things even more relaxing by choosing to play slower songs for the first few miles. This included Do I Have To Say The Words (Bryan Adams), Hands Held High (Linkin Park, yes they have slow songs), Just Don't Think I'll Ever Get Over You (Colin Hay) and the prelude music from Harry Potter. Normally, I'm all about adrenaline-pumping rock music, but at the start of a long road, it's nice to settle into a calm, comfortable pace. As a result, I felt strong and confident early on, and it never went away. It really struck me that there was no part of my brain that said I couldn't do this today. Every fiber of my being knew that I was going to finish, because I believed it was possible. Also, I didn't stop. I kept running. I had to stop for only one stoplight for any period of time, and starting up after that was agonizing, but after a couple blocks, it cleared out again. As long as I kept moving, I had no problem. I did try something new today. I had some energy goo. If you know about this stuff, or have ever tried it, you might, rightfully, be suspicious. First off, it's pretty nasty. The flavor is fine, but it's so, so sticky, and when you've been running for over an hour (as I had been when I had the goo), your mouth already feels like it's full of paste. You MUST take these with water, and I did. First, the good news: I definitely had more energy. I've had no caffeine for a couple weeks, and there is some in the packs. Hitting ten miles, I felt a second wind come over me. Unfortunately, I felt something else. A huge stomach cramp. It only lasted about a mile, so it was worth it in the end. Still, I brought two with me, and I only used one. Generally, it was a good run. Certainly, it was well-timed. I ran out of sidewalk on Burnet, but it was light enough that I didn't worry about getting hit by a car, and yet still early enough that there weren't any cars to hit me. I didn't watch my time. In fact, I only checked one split, and that was what my half-marathon time would have been. One hour, forty-four minutes. Suddenly - and I do mean suddenly - I was within two miles of home. I hurt, but I felt great, too. I remembered the last two weeks, and I felt strong. I had already run longer than either of those gut-wrenching Sundays, and I had energy to spare. Sure, there will be even more on race day, but today went a long way to restoring my shaken confidence. Score one for the neutral guys. 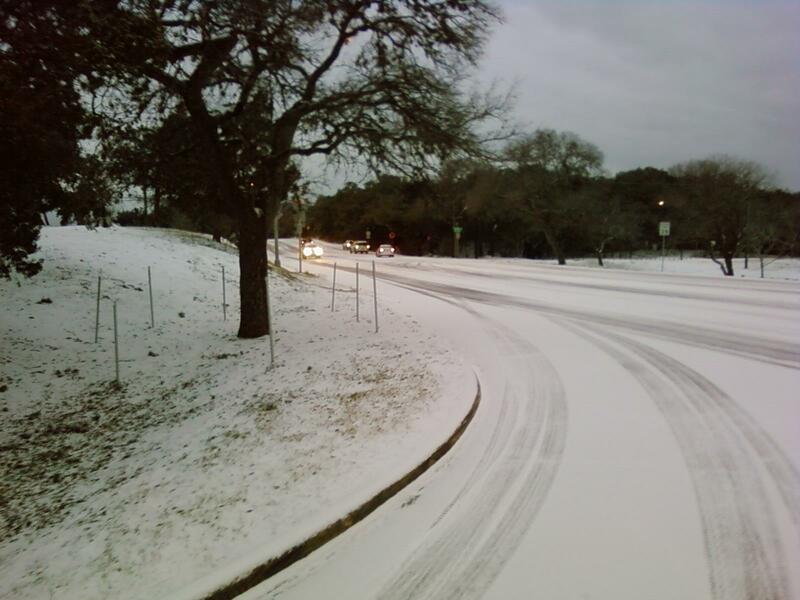 As predicted, Austin was hit last night with 1-2 inches of snow. As expected, this caused the entire city to screech to a halt. But the trouble wasn't in the snow. It was underneath. Usually Friday is my running day with the dog, and though she tends to slow me down and sometimes be a bit of a pain, I enjoy it. It's nice to get her the exercise she needs, and it's fun to have someone to talk to around mile 3. Given the very low temperature and the condition of the roads, we decided that today was probably not the best day for her to come with me. We think she knows she missed out with the way she's been pouting all day. After a quick stop outside to see how she would react to the snow (she was largely unimpressed), I headed down the hill (carefully) and onto the street. What I saw really amazed me. 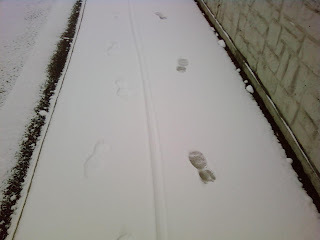 I've talked about the mile-long uphill that leads to our apartment before. Well, there is one stretch of about 100 yards that runs from the highway and past our complex's driveway that is downhill before the road curves and heads up again. It creates a bit of a valley, which I hadn't really noticed until this morning. The roads were completely covered in ice that was probably .5-1" thick. Just one big sheet. There were six cars sitting there, stranded. They'd been stopped by the traffic light (or the car in front of them), which left them with no momentum and no traction. They were slowly sliding backward down the hill. 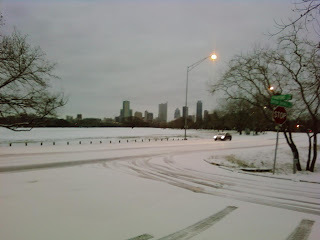 Now, one of my hobbies in Chicago was to go around the day after a big snow and push people out. You see, with snow, it's all about the angles. Your car can deal with it, you just have to make sure you're approaching it correctly. 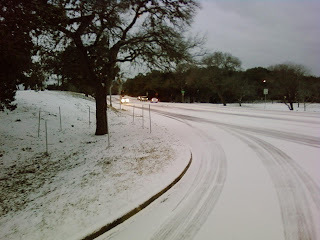 I was a little sad that I wouldn't get to do this in Austin (as it NEVER snows here), so I jumped at my chance. I went to the first car and started pushing, but I found out that there was no way for me to get traction on the ice. I eventually directed the guy to back down the hill and get up next to the curb where there was some pavement, and I pushed him up the slope. Realizing that these folks would be fine if they didn't have to stop, my next choice was the person at the front of the line. If I could clear her out, then maybe everyone else could just use their momentum. Unfortunately, she was dead in the center of the road, and there was absolutely nothing to grip. With three of us pushing, we couldn't move her. She thanked us, and I realized that they just needed someone to come with salt, and the woman had said her husband was on the way. I left it to him. I headed back to the point at which I'd left the sidewalk to start up again, and took one last look at the street. There was the first guy I'd helped. He's been stopped at the light and had slid back down. So, I went for my run. Austin was like a ghost town. Very few people were even on the roads, and most that had ventured out wished they hadn't as they sat helplessly at the bottom of hills. Already aware that there wasn't much I could do for these folks, I continued on, actually enjoying the run. It's really not that difficult to run in snow, up to a couple inches. Particularly if it hasn't been shoveled yet, the traction isn't too bad, again, as long as you come from the right angle. It was very quiet and peaceful running when no one else was out. I was careful, though, because I didn't want someone spinning out of control and taking me out. I wish I'd had a better camera with me, because some of what I was seeing was just amazing. I did learn a few things, though. 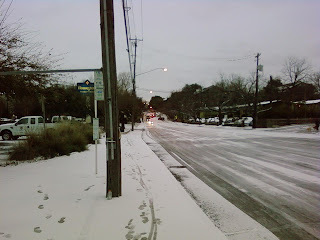 For one, ambulances and buses in Austin all seem to have 4-wheel drive. Other people are not so lucky. For another, a little thing like a freak snow storm doesn't stop the car wash from running. And finally, no one else appeared stupid enough to go for a run this morning. There are two sets of prints. Mine coming, and mine going. Also a bike. I climbed back up the hill, wondering if the woman I'd tried to help had gotten free, and then, suddenly, I remembered something. 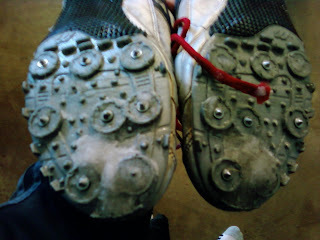 I still had, in our storage closet, the running spikes that I wore in high school. I've kept them all these years as nothing more than a reminder of when I went to state, and for the first time in almost 9 years, I needed them again. As I neared the turn onto our road, someone honked at me. The woman had just gotten free, 40 minutes later. I smiled and waved, wondering if the problem had been fixed. It had not. There was a full-scale traffic jam, with two guys pushing the cars in front as best they could. I helped one little blue car right away, and then hurried up the hill to get my spikes before returning. I have a point system with winter. Every time it makes me fall, winter gets one point. Every time I help a stranded car, I get one. Today, I took the lead. For more than an hour, I pushed cars up the hill, with the help of several other people, usually 1-2 at a time. The average helper lasted two or three cars before I pushed theirs up, and I probably had 8-10 cars that were just me. I was just beginning to wear out when a guy showed up with a pickup truck and chains to get the last two cars that were stuck on the hill. By that time there was enough of a path that people could go through solely on momentum, and the sun had begun to melt everything. I put out a lot of good Karma today, and I'm totally winning at Winter, though it did take a cheap shot at my shoes.